Ceylon was ceded to British in year 1796. Sir Frederic North was proclaimed the Governer of Ceylon with the exception of the Kandyan Territory ruled by the King of Kandy, by a commission dated 06th March 1798. The famous land proclamation dated 3rd May 1800 desired abolition of common land holdings and envisaged individualization of land ownership and there by land surveys become a vital need Having explored whatever the existing mode of Surveying of land in the island, the proclamation dated 2nd August 1800 was made outlining the original functions of the Surveyor General by the Governor “Sir Frederic North” and as a consequence, the Ceylon Survey Department was established. Most of the Surveys carried out by the Survey Department during first 50 years were confined to preparation of Title plans to sale lands. The establishment of control for surveys in the island commenced with the base measurements in 1857 for Principal Triangulation. By the end of 19th Century, Survey Department engaged on wider range of surveying functions including Block Surveys for land settlement, Topographic Surveys for Mapping, Application / Miscellaneous Surveys including Irrigation Surveys, Road / Railway Surveys, Forest Surveys etc.. and the increase of field cadre was very much significant. In early days surveyors camped in survey site and precede their work from the camp which was identified as an effective system, since the lack of facilities available for transportation, communication etc.. Also, the survey labourers attached to the individual surveyor also station at their “wadiya” close to the survey site. During early 1900’s, i.e., at the beginning of 20th century, the department had established geodetic triangulation network with 1:40,000 average accuracy and after that the entire island was mapped using plane table method at the scale of one inch to one mile. This map series popularly known as “One Inch Topographic Map Series” consist of 72 sheets to cover the entire Island. With regard to the Geographical Names, a Gazetteer has been prepared in the office of Geography, Department of Interior, Washington D.C in June 1960 containing official standard approved by the United States Board on Geographic Names, as well as unapproved variant names. This Gazetteer contains about 29,600 entries for places and features in the country based on 1 inch topographic map series prepared and completed in 1924 by the Survey Department of Sri Lanka being the National Mapping Organization. This map series contain all the geographical names that are in practical use at the time of preparation of the map series in respect of place/village names, natural and man made topographical features, administrative areas etc. 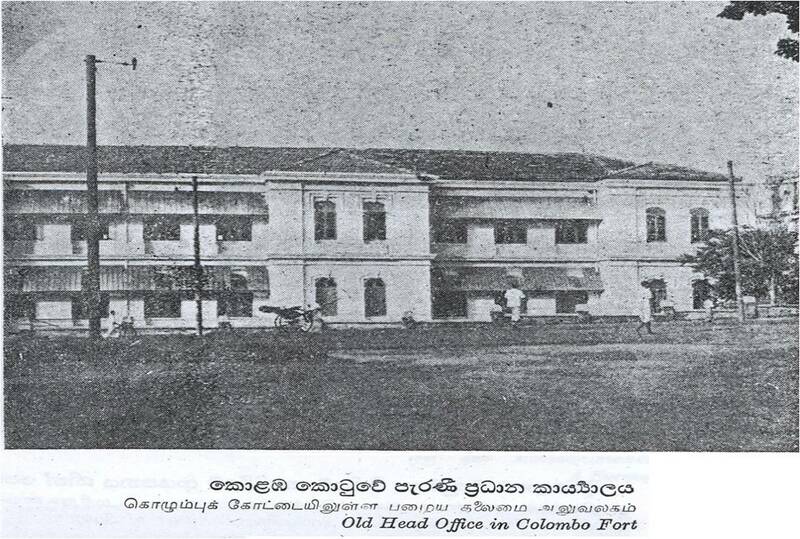 After getting freedom to the country in 04th February 1948, Survey Department was headed by Sri Lankan Surveyor Generals instead of British officials. Sri Lanka was completely Aerial photographed at the scale of 1: 40,000 in 1956 by a foreign company. Subsequently using departmental air craft, country has been photographed again at the scale of 1:10,000 (coverage 5%), 1: 20,000 (coverage 100%) & 1: 40,000 (coverage 70%). For aerial photography and photogrammetric data capturing the department used Cessna air craft, ‘WILD RC2O aerial camera, analogue plotters with digital encoders, analytical plotters and digital photogrammetric workstations. 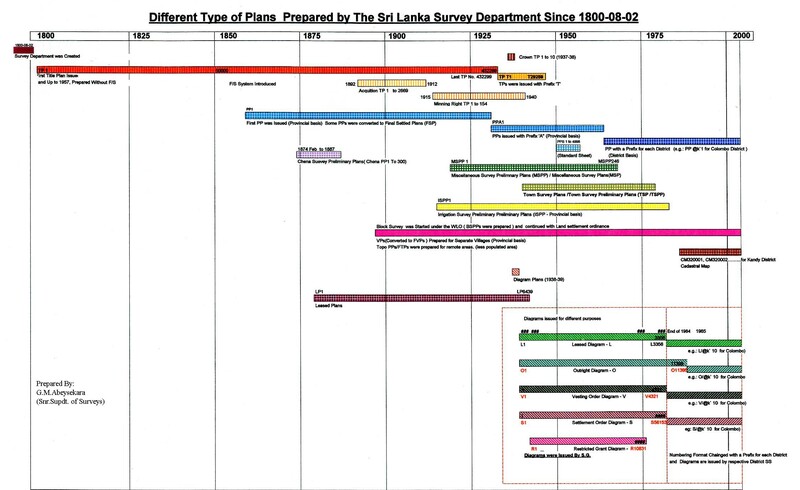 During 1980’s with the assistance of Sri Lanka /Swiss Remote Sensing project, department has acquired SPOT, LANDSAT (MSS & TM), IRS satellite imagery and image processing software for mapping activities. After Sri Lanka converted itself into the metric system of measurements in 1982, a new topographic map series was prepared on the scale of 1: 50,000, and there are 92 maps in this series to cover the entire country. During the period 1980 – 1997, the department had produced this Topographical map series by combining one inch maps and aerial photographs, and parellal to the 1: 50,000 production, department had engaged in producing 1:10,000 map series using photogrammetric methods and high resolution satellite images. The topographic data in those map series are also available in digital vector form as a topographic vector database for GIS applications and Digital Mapping. At the same time with the changes of the new technologies in Surveying & Mapping fields around the world and user demands for different type spatial information were increased. As a result, the department had introduced Geodetic type Global Positioning System (GPS) receivers in 1999 to determine the co-ordinate values of the ground control points. Since the accuracy of the Geodetic network established in early 1900’s was inadequate to meet the new demands, new geodetic net work for the entire country was established in 1999 to work with Global Positioning Systems. According to the adjustment, statistical accuracy of the new network was around 1: 750,000 which is suitable for ongoing mapping and cadastral survey procedures. Moreover, the SLSD owned a GPS permanent reference point linked with the world net namely DORIS point, which was established in 1993. It was not functioning some time and however, recently it was re-established and being updated with the foreign aids. With the assistance of the foreign funded project (SRIIM-2007-2009) SLSD was able to update the topographic database for the southern part of the country as well as create the spatial data layers for the Eastern coastal belt. A high resolution satellite data used for updation and new spatial data creation too. Recently, the colour photography of the Northern Province were completed under the JICA project of “Digital topographic Mapping project of Northern Region”. In 2015 under the assistence of the JICA the department is introduced the Lidar technology and lidar data avaliable in Western, Sabaragamuwa & Central provinces. The Survey Department is being strategically re-organizing its system architecture in order to facilitate the customer needs and fulfil the national requirments.